I have a bad case of eco-guilt. At first my symptoms were minimal: a pang of shame when I toss a plastic bottle in the trash, remorse when I learn a favorite product is not recyclable (I’m looking at you Glossier), a bitter taste in my mouth when I purchase yet another plastic toothbrush. Most of the time, these lapses in conscience last only a few minutes. I brush off my guilt like a dog shakes water droplets from its coat. Yet as I age, my flashes of regret are blossoming into burdensome shame. The strength of my guilt is directly related to my new, sustainable income. As my wage increases, so does my willingness and ability to invest in environmentally friendly goods. Though it is unfortunate that “green” products are more expensive than their less-sustainable counterparts, one cannot escape the inalienable truth: people with more money have more opportunity (and are often more likely) to buy sustainable goods. As I have recently earned a raise, I have taken a few steps to make my life more eco-friendly (see also, "4 Easy Ways to Make Your Beauty Routine More Environmentally Friendly"). My primary goal in replacing old products with new, sustainable goods is to cut plastic usage in my life. Plastic can take over 400 years to begin to decompose and the pollutant is all pervasive; it has been found in the bellies of marine life, at the bottom of the world's largest ocean trench, tap and bottled water, and more. Sure I recycle, but everything put in the bin is not guaranteed to end up in a recycling plant. Better to reduce and reuse than consume plastic in the first place. That being said, here are a few eco-friendly products and habits I have invested in. Though some goods can be quite expensive at face value, they pay off in the long-term. When I was on the prowl for a Ziplock alternative, Bee's Wrap continued to fill my feed. I bought a pack and fell in love. Bee's Wrap are plastic-free, compostable, and biodegradable alternatives to plastic wrap and sandwich bags. The product is a flat pieces of fabric coated in actual beeswax. When warmed (by your hands as you fold or twist the fabric) the beeswax becomes tacky and creates a natural seal (and no, your food will not absorb the wax taste). You can use them to wrap up small snacks like nuts and crackers, fruits, fresh bread and cheese, and even to seal off containers. Not to mention Bee's Wraps lasts at least one year. Technically, this is not a new change for me. I have never liked paper towels—a distaste I learned from my mother. I was often chastised for using paper towels as a child when a napkin or a washcloth could get the job done instead. As I grew older, I decided buying one-use towels was a waste of money. * Instead, I invested in inexpensive wash cloths—like these, though there is a biodegradable cloth alternative here—and put a basket beneath my kitchen sink. I use a cloth, rinse it and let it dry, and reuse it until it's a bit too nasty. When I cannot stand to touch the cloth anymore, in the bin it goes. I simply empty the bin on laundry day and then I am good to go. Super easy and it keeps old, stinky rags out of sight. I have also been eyeing these DIY paper towels from A Beautiful Mess. If you make these, let me know in the comments how they worked out! *I will admit, my household does keep a roll of paper towels or shop towels in the home for painting purposes, as my partner and I are both artists. Haven't been able to cut these from our life yet! This is a new one for me. I did not know shampoo bars existed until I received a targeted ad on Instagram (who knew those could actually be useful?). I bought two from Chagrin Valley Soap & Salve Co. and I love them. 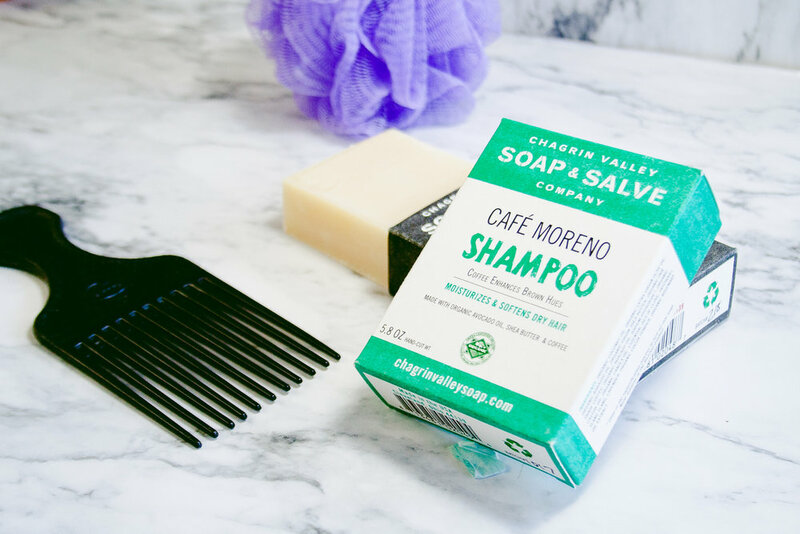 Chagrin Valley's shampoo bars are easier to lather than liquid shampoo, less product is needed to cover one's head, the bars are made from natural ingredients, and the shampoo arrives in recyclable paper container rather than plastic packaging. So far, the bars give me the same results as all my previous shampoos, making the switch easy. But be forewarned, there can be an adjustment period when you first start using the product regularly (though I did not experience this). If you are nervous about switching to a shampoo bar full time, Chagrin Valley's bars also works great as a weekly clarifying wash. When I was growing up, my dad washed our toothbrushes in the dishwasher to sanitize them. We kept using the brushes until the bristles were splayed and there was no alternative but to buy a new brush. I cannot imagine a dentist recommending this dental hack, but heck, it saved us money and reduced our plastic waste. According to Ecoplanet Bamboo, the United States throws away an estimated 850 million to one-billion toothbrushes yearly, which equates to more than 50 million pounds of waste. If you're following the American Dental Association recommendations, you may only contribute three to four brushes yearly to the U.S. toothbrush trash. Nonetheless, why do it if you can avoid plastic waste altogether–and for cheap? Nowadays, I don't wash my toothbrushes in the dishwasher. Instead, I invested in an eco-friendly alternative. There are tons of brands out there, from Bogobrush to Baboo, but I opted for Goodwell. Goodwell offers a variety of goods: biodegradable bamboo brushes and floss, recycled aluminum with biodegradable attachment heads, and even a rotating toothbrush sans-battery. I bought my partner and myself the aluminum brushes. Not only are they sleek, but we signed up for a brush replacement program so that a new brush head is sent to us every 3 months. We avoid tossing a plastic toothbrush and still follow the ADA's recommended replacement cycle. Look, I never remember my reusable bags when I go to the grocery store and I know I am not the only one. That being said, when I do roll into the store I always go for paper or, if I can carry all my products, no bag at all. My partner and I use paper bags as our recycling receptacles which forces us to recycle them weekly with the rest of our bottles and cans. In addition, we don’t have a plastic bin that will gradually absorb dripping juices or stinky foreign stains (doesn’t matter how much you rinse those cans, you’re going to find goop in your recycle bin!). And that's it! These are five simple changes I have made in my purchasing habits lately. Not only have these steps eased my eco-guilt, but they help the earth, too. And best of all, these practices were so easy to implement.